The key is discovering what excites people about a project, being able to articulate this source of excitement in an appealing manner, and finally protecting and nurturing this source of excitement throughout the duration of the project. Unlike project scope statements, which include specific cost, completion dates, and performance requirements, a project shared vision involves the less tangible aspects of project performance. It refers to an image a project team holds in common about how the project will look upon completion, how they will work together, and/or how customers will accept the project. What is a Project Shared Vision? At its simplest level, a project shared vision is the answer to the question, “What do we want to create?” Not everyone will have the same vision, but the images should be similar. Visions come in a variety of shapes and forms; they can be captured in a slogan or a symbol or can be written as a formal vision statement. What a project shared vision is, is not as important as what it does. A shared vision inspires members to give their best effort. Moreover, a shared vision unites professionals with different backgrounds and agendas to a common aspiration. It helps motivate members to subordinate their individual agendas and do what is best for the project. As psychologist Robert Fritz puts it, “In the presence of greatness, pettiness disappears.” Visions also provide focus and help communicate less tangible priorities, helping members make appropriate judgment calls. Finally, a project shared vision for a project fosters commitment to the long term and discourages expedient responses that collectively dilute the quality of the project. Visions can be surprisingly simple. For example, the vision for a new car could be expressed as a “pocket rocket.” Compare this vision with the more traditional product description—”a sports car in the mid price range.” The “pocket rocket” vision provides a much clearer picture of what the final product should be. Design engineers would immediately understand that the car will be both small and fast and that the car should be quick at the getaway, nimble in the turns, and very fast in the straightaways. Obviously, many details would have to be worked out, but the shared vision would help establish a common framework for making decisions. First, its essential qualities must be able to be communicated. A vision is worthless if it only resides in someone’s head. Second, visions have to be challenging but also realistic. For example, a task force directed at overhauling the curriculum at the college of business at a state university is likely to roll its eyes if the dean announces that their vision is to compete against the Harvard Business School. Conversely, developing the best undergraduate business program in that state may be a realistic vision for that task force. Third, the project manager has to believe in the vision. Passion for the vision is an essential element of an effective vision. Finally, it should be a source of inspiration to others. 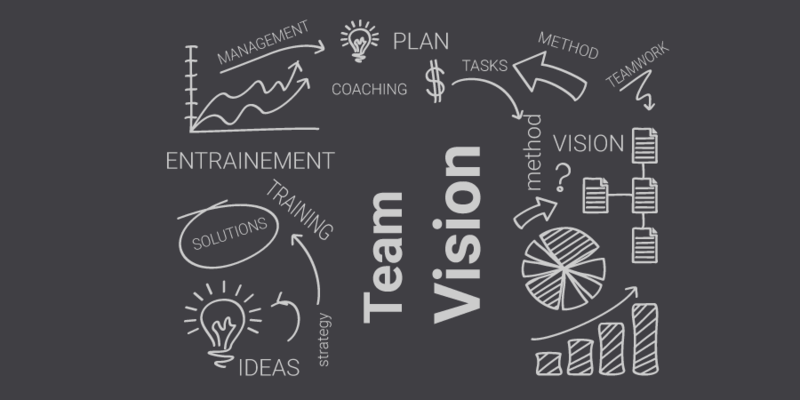 Once a project manager accepts the importance of building a project shared vision, the next question is how to get a vision for a particular project. First, project managers don’t get visions. They act as catalysts and midwives for the formation of a shared vision of a project team. In many cases visions are inherent in the scope and objectives of the project. People get naturally excited about being the first ones to bring a new technology to the market or solving a problem that is threatening their organization. Even with mundane projects, there are often ample opportunities for establishing a compelling vision. One way is to talk to various people involved in the project and find out early on what gets them excited about the project. For some it may be doing a better job than on the last project or the satisfaction in the eyes of the customers when the project is over. Many visions evolve reactively in response to competition. For example, the Kodak team responsible for developing the single-use FunSaver camera was driven by the vision of beating a similar effort by Fuji to the market. Some experts advocate engaging in formal vision-building meetings. These meetings generally involve several steps, beginning with members identifying different aspects of the project and generating ideal scenarios for each aspect. The group reviews and chooses the scenarios that are most appealing and translates them into vision statements for the project. The next step is to identify strategies for achieving the vision statements. For example, if one of the vision statements is that there will be no lawsuits, members will identify how they will have to work with the owner and subcontractors to avoid litigation. Next, members volunteer to be the keeper of the flame for each statement. The vision, strategies, and the name of the responsible team member are published and distributed to relevant stakeholders. In more cases than not, a shared vision emerges informally. Project managers collect information about what excites participants about the project. They test bits of their working vision in their conversations with team members to gauge the level of excitement the early ideas elicit in others. To some extent they engage in basic market research. They seize opportunities to galvanize the team, such as a disparaging remark by an executive that the project will never get done on time or the threat of a competing firm launching a similar project. Consensus in the beginning is not essential. What is essential is a core group of at least one-third of the project team that is genuinely committed to the vision. They will provide the critical mass to draw others aboard. Once the language has been formulated to communicate the vision, then the statement needs to be a staple part of every working agenda, and the project manager should be prepared to deliver a “stump” speech at a moment’s notice. When problems or disagreements emerge, all responses should be consistent with the vision. Much has been written about visions and leadership. Critics argue that vision is a glorified substitute for shared goals. Others argue that it is one of the things that separates leaders from managers.